A commercial gold pan will set you back around $20, which is not too expensive. But you really don't need to buy one. You don't even need to actually make a gold pan. In most cases you can just find a pan that can get the job done. It's easy enough to just find a suitable, makeshift pan at home. Thankfully a makeshift gold pan can be just as effective as a store-bought brand. So If you want to give panning a try but would like to avoid dropping your hard-earned cash on equipment, then read on. Here's how you can find your own gold pan. In general, pans are pans. But there are a few factors to keep in mind to ensure that your makeshift gold pan does the job correctly. Prospecting is more of a marathon than a sprint. You'll likely have to spend an extended period of time in the water before you see any results. For that reason, your homemade pan should be lightweight and shallow. A lightweight design is also beneficial when carrying your equipment to your chosen prospecting location. Proper panning technique requires you to hold your pan with both hands, therefore your gold pan must be easy to grip on all sides. There is no limit to the items you can use as a gold pan. As long as your homemade gold pan meets the criteria outlined above then you're good to go. Some of the most popular gold pan alternatives include bowls, buckets, and Tupperware. We've even heard reports of people successfully panning using a hat. In South America, prospectors often use something called a batea. A batea is basically a large wooden bowl. It differs from other gold pan alternatives in that panning is its primary purpose. You're unlikely to have a batea lying around the house, but you could find something similiar such as a round ceramic bowl. If you would rather use a commercial gold pan, then you won't have any trouble buying one online. We recommend the Sona Plastic Gold Pan. 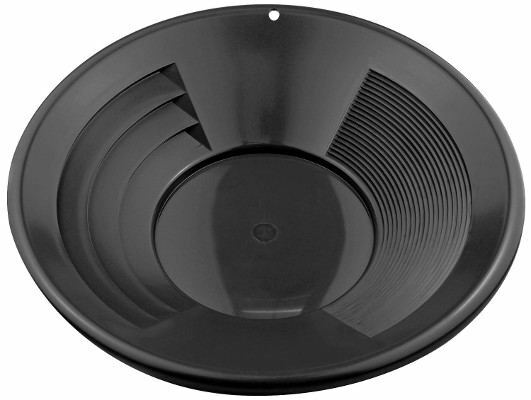 Designed exclusively for prospecting, the Sona Plastic Gold Pan is 14 inches in diameter with a 1/8 inch deep base. These dimensions allow it to trap gold more effectively than many commercial and homemade models. Its deep riffles work in conjunction with a set of shallow riffles to capture both lode and placer gold. The Sona Plastic Gold Pan goes for about $10 and can potentially pay for itself within a few days of prospecting. It's available in a few different sizes, but the 14-inch model is the most popular among prospectors. In the 1800s, commercial gold pans were a rare sight. During the California Gold Rush, most prospectors relied on pots and pans. Some even used their bare hands. Despite this, many of them managed to extract large amounts of gold from the state's rivers. This goes to show that a homemade gold pan can be just as effective as a commercial alternative. Your prospecting location is the most important factor in obtaining success. For example, panning in California will be more rewarding than in most other states. Patience and practice is far more important than the features of any pan. If you put in the time needed to develop your panning skills then you'll see positive results regardless of your equipment.